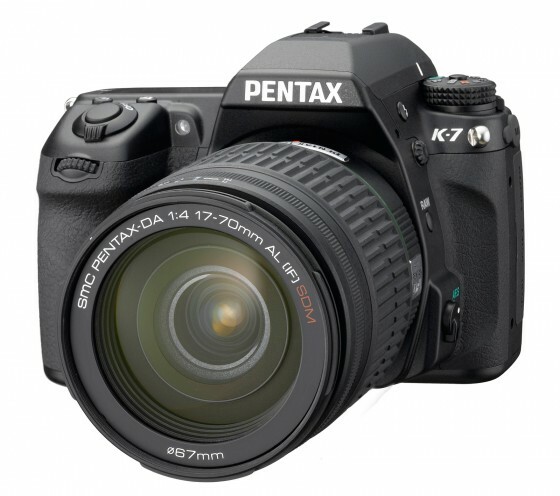 Pentax’s latest K-series digital SLR camera, the K-7, has been officially announced. The mid-level DSLR features a rugged weather-sealed body, 14.6 megapixel CMOS sensor, 100% viewfinder, a 3″ 921K dot LCD screen, 5.2 frames per second (FPS) continuous shooting speed, 11 point AF sensor (9 cross types), 30 fps video shooting at [0.9M] (1280×720, 16:9), [1.6M] (1536×1024, 3:2), [0.3M] (640×416, 3:2) resolutions using MPEG format, built-in dust removal and shake reduction, and HDMI port. Other interesting features include the ability to compose a high dynamic range (HDR) image using three photos, a built-in digital level, and in-camera editing using digital filters. The Pentax K-7 is indeed a solid offering, but the $1,299.95 body-only price seems a little high in the very competitive DSLR market. The camera will be available in July. For more information, check out the in-depth preview at DPReview and the following official press release from Pentax Japan. HOYA CORPORATION PENTAX Imaging Systems Division is pleased to announce the launch of the PENTAX K-7 lens-interchangeable digital SLR camera. Despite its compact, lightweight body, this new model brings together a wide array of advanced functions and user-friendly features with outstanding reliability and operability. This makes it possible to enjoy high-quality digital SLR photography with great ease. The K-7 has been developed as a high-end model of the PENTAX K digital SLR camera series. True to its series concept, it was designed not only to assure outstanding image quality, but also to provide exceptional ease and comfort of operation and the utmost satisfaction to photo enthusiasts of all levels, including advanced amateurs. After making a thorough review of all essential digital SLR camera components and functions, PENTAX has revised and upgraded many of them, including viewfinder, shutter unit, continuous-shooting capacity, and exposure and autofocus systems. Protected by a durable, high-quality metallic body, but the K-7 is designed to be extremely compact and functional — just like all other K-series models — for enhanced portability and maneuverability. In addition, it has added several user-friendly features, including video recording, high dynamic range (HDR), and automatic horizon correction. All of these make the K-7 a tremendous photographic tool, perfect for all discerning digital SLR photographers. The K-7 is built exceptional solid and durable, as its chassis is made of high-rigidity stainless-steel alloy and its housing is made of durable but lightweight magnesium-steel alloy. Thanks to 77 special seals applied to the body, it also features a dustproof, weather- and cold-resistant construction, assuring reliable operation even under harsh conditions and at a temperature as low as -10°C. It also features a newly designed shutter unit providing a top shutter speed of 1/8000 second and the outstanding durability to withstand 100,000 shutter releases. Despite all these features, the K-7 is one of the most compact and functional mid-class models in the market, because PENTAX applied all the experience and expertise in camera downsizing the company has developed from the earliest days of film-format SLR cameras. The K-7’s glass prism finder offers an approximately 100% field of view and an approximately 92% magnification to facilitate focusing and framing operations. It also features a new Natural-Bright-Matte III focusing screen to improve focusing accuracy during manual-focus operation. The K-7’s high-speed continuous shooting mode captures as many as 40 images (in JPEG recording format) at a maximum speed of approximately 5.2 images per second, allowing the photographer to follow the movement of an active subject or preserve a sequence of the subject’s expressions. The K-7 comes equipped with the newly developed DR (Dust Removal) II mechanism, designed to effectively minimize annoying dust spots on recorded images, even after changing lenses in dust-prone outdoor settings. By shifting the low-pass filter located in front of the CMOS image sensor at supersonic speed using a piezoelectric element, it shakes the dust off the low-pass filter as effectively and efficiently as any other dust removal device. The K-7’s unique dust-alert system also lets the user check for dust adhering to the low-pass filter prior to actual shooting. The K-7 incorporates a newly developed CMOS image sensor measuring 23.4mm by 15.6mm and featuring a high-speed, four-channel image data readout. With approximately 14.6 effective megapixels, this image sensor can faithfully and accurately reproduce fine-detailed, gradation-rich images. With the adverse effects of digital noise greatly reduced, the sensitivity can be increased from ISO 100 up to the highest level of ISO 6400 (via a custom function) without worry. The K-7 features the newly developed PRIME (PENTAX Real Image Engine) II, an upgrade of the original PRIME, as its imaging engine. This new imaging engine offers greater data-processing speed and produces better-quality images with richer gradation and more accurate color rendition. It also offers high-speed movie data transmission. Newly developed for the K-7, a sophisticated 77-segment multi-pattern metering system greatly improves light-metering accuracy. By accurately analyzing various types of data (such as the image’s composition and format between upright and horizontal, and the subject’s distance and magnification) transmitted from the sensors in the camera body, this system greatly improves the accuracy of exposure control. The K-7 features the PENTAX-developed SR (Shake Reduction) mechanism, which effectively compensates the adverse effect of camera shake by approximately 2.5 to four shutter steps, assuring sharp, blur-free images even under demanding shooting conditions. This innovative mechanism is compatible with all PENTAX interchangeable lenses — even most of the lenses designed for film-format cameras. * Since this new-generation version can freely shift the image-sensor unit to keep it level regardless of the camera’s inclination, it also provides such user-friendly new functions as automatic level adjustment and minute angle adjustment (in the direction of up/down, right/left and clockwise/counterclockwise), helping to compose the image exactly the way the photographer wants. * Lenses compatible with this mechanism are the PENTAX K-, KA-, KAF-, KAF2– and KAF3-mount lenses; screw-mounted lenses (with an adapter); and 645- and 67-system lenses (with an adapter). Some functions may not be available with certain lenses. The K-7 features the Live View function, which allows the user to view the image on the LCD monitor during shooting. You can take advantage of this convenient function not only in the Contrast AF mode, which optimizes the focus based on the subject’s contrast, but also in the Face Recognition AF mode, which automatically and accurately focuses on the subject’s face. Thanks to the newly developed diaphragm-control mechanism, the Live View function can also be used in the continuous shooting mode with the mirror at lock-up position. The K-7 adds a new movie recording function, extending the benefits of SLR photography to the world of movie shooting: For instance, reduce the depth of field to make the subject stand out, or use different lenses to create distinctive visual effects. Beautiful movie clips can recorded at different sizes — 640 x 416 pixels, 1536 x 1024 pixels, or 1280 x 720 pixels (16:9 high-definition TV proportions) — at a frame rate of 30 frames per second. The K-7 is also equipped with an HDMI terminal and an external microphone input terminal. The K-7’s new SAFOX VIII+ wide-frame autofocus system features 11 sensor points (with nine cross-type sensors positioned in the middle). By adding a light source type to its data range, and driven by a greatly improved algorithm, this AF system assures reliable, responsive autofocus operation superior in speed and accuracy to the previous system. The K-7 also incorporates an AF-assisting spotbeam projector in its built-in flash unit to improve autofocusing accuracy in the dark. The K-7’s Custom Image function lets the user control the image’s finishing touch to capture their photographic intention, or reproduce the ambience of the scene. With the K-7, the user can select one of seven modes, including the new “Muted” mode designed to recreate an image with delicate, subdued colors. In addition to saturation, tone, contrast and sharpness — the factors previously available — it is now possible to adjust “key” and “contrast highlight/shadow” to the desired levels. The effects of these factors can be effortlessly confirmed on a preview image using the Digital Preview or Live View function before finalizing the settings. The K-7’s Hyper Program function allows the user to instantly switch to the Shutter- or Aperture-Priority AE mode from the Programmed AE mode, with a simple turn of the electronic dials on the grip. To return to the Programmed AE mode, simply press the green button positioned next to the shutter release button. The K-7 features a unique Sensitivity-Priority (Sv) mode, which is designed to automatically select the optimum combination of aperture and shutter speed for a user-selected sensitivity. The sensitivity can be shifted instantly in 1/2 or 1/3 steps by turning the electronic dial on the back panel. The K-7 features a large 3.0-inch color LCD monitor with approximately 920,000 dots on its back panel. Its wide-view design allows the photographer to check the monitor image from approximately 170 degrees both vertically and horizontally, facilitating low- and high-angle shooting using the Live View function. The K-7 is powered by a large-capacity, rechargeable lithium-ion battery, which can capture approximately 980 images** when fully charged. ** Under testing conditions prescribed by PENTAX, when using a rechargeable D-LI90 lithium-ion battery with no flash. Exclusively designed for the PENTAX K-7 camera body, the Battery Grip D-BG4 is powered by either a rechargeable lithium-ion battery or six AA-size batteries. Since it supplements the camera’s battery as an additional power source, the number of recordable images is greatly increased. To facilitate vertical-position shooting, this grip features extra shutter-release button, preview lever, electronic dials, AE-lock button, Green button and AF button. It also provides the same dustproof, weather- and cold-resistant construction as the camera body itself. PENTAX KAF3, KAF2-, KAF-, and KA-mount lenses. * Power zoom function available. K-mount lenses usable with restrictions. S-mount lenses, 67/645 lenses usable with adapter and with restrictions. approx. 670g (22.9 oz.) without battery and SD memory card. *1 Recording capacity shows approximate number of shots recorded during CIPA-compliant testing. Actual performance may vary depending on operating conditions. PENTAX, K-7, and PENTAX Digital Camera Utility are trademarks of HOYA CORPORATION. The feature set is definitely nice but Pentax is up against established players Nikon and Canon. It has to be more competitive to grab market shares from them. We can certainly expect the actual street price to go lower soon.